от 100 шт. — 228 руб. 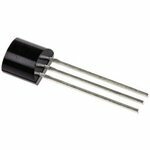 The LM35 range of analogue temperature sensors from Texas Instruments give a 10 mV/°C output voltage directly proportional to the device temperature. The LM35 is suitable for various applications including home appliances, mobile phones, gaming, disk drives, battery management, portable medical instruments and printers.